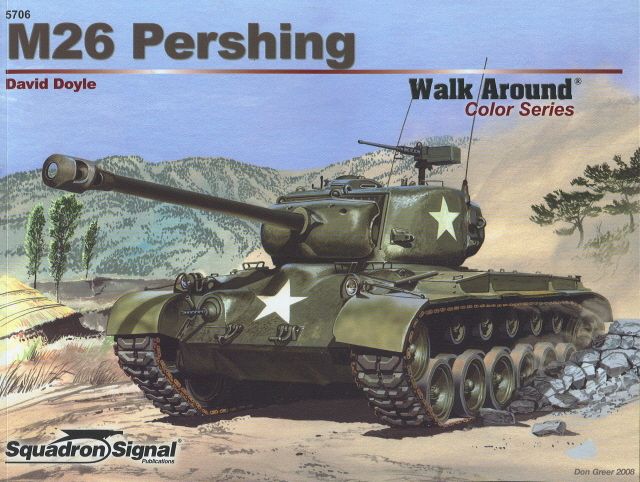 The M26 Pershing descended from a long series of medium and heavy tank prototypes, dating back from 1936. During the war, heavy tank development had been long delayed or given low priority since the US Army, USMC and Allied forces required a mass-built, good-all-around medium tank, which took the shape of the Medium M4 Sherman. By 1944, the High Command was aware of the limitation of the M4 when facing German tanks. By mid-1944, both the British and US had undertaken upgrades in armor and guns on the Sherman, and developed tank-hunters instead of mass-producing a brand new model. However, by the fall of 1944, these stopgap measures proved insufficient, and the innovative M26 was eventually pushed forward for production. But it was a bit too late. The Pershing saw little combat and mostly soldiered during the Cold War, starting with Korea. At last, the crews had the ideal tank to deal with German armor, but historians and authors still debate about the causes of such delays. Could the Pershing have been a game changer if introduced earlier? 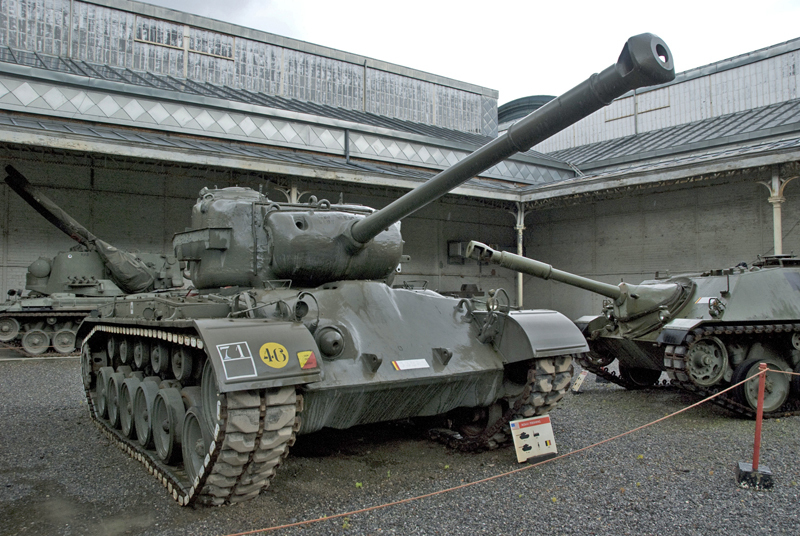 Development of the T20 Medium Tank started as an upgrade over the M4 in 1942. This new tank had common features with earlier models, notably the characteristic suspension (HVSS) bogies, roadwheels, return rollers, drive sprockets and idlers. By May 1942, a mock-up of the T20 had been already produced. U.S. Army Ordnance also ordered the development of the M6 heavy tank, which would prove a dead end. The main feature of the T20 was the lower silhouette and more compact hull, allowed by the availability of the new Ford GAN V-8 combined with a rear transmission and rear sprocket drive layout. This engine was an early attempt to produce a V12 with similar layout and performances to the Rolls Royce Merlin, but development was stopped and the engine was turned into a smaller V8. Other improvements included a sturdier horizontal volute spring suspension (HVSS), a longer barrel version of the 75 mm (2.95 in) (M1A1), and 76.2 mm (3 in) front armor. The weight and width were very similar to the M4, allowing transportation in similar conditions. However, the T20 also pioneered the Torqmatic transmission, which proved highly problematic during trials. Problems with the Torqmatic dictated a return to the M4 transmission, leading to the T22. Variants of this medium tank also tested an autoloader, thus reducing the turret crew to just two. 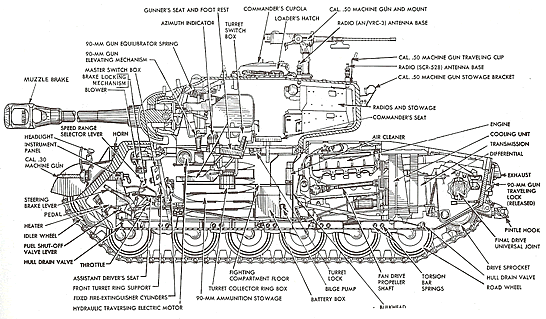 In 1943, the need to replace the M4 was not apparent, and the U.S. Army Ordnance decided to test several electrical systems on the next T23 Medium Tank, mainly the transmission. These entered service but, because of maintenance and supply problems, only operated on U.S. soil for the duration of the war, mainly for training purposes. The T25 was a new design, up-armored and up-gunned. This was done as it was clear, after the first encounters with German upgraded Panzer IVs, Panthers and Tigers, that the M4 was less up to the task than previously thought. The debate was heated, but finally, a breach opened and clear-cut decisions were taken after the reports came from Normandy. Meanwhile, a series of T25s was built, inaugurating a new, far larger cast turret derived from the one on the T23, in order to accommodate a 90 mm (3.54 in) gun. The T26 added upgraded armor to the mix, with a new 102 mm (4 in) thick glacis and reinforced hull. Their overall weight rose to 36 tonnes (40 short tons), up into the category of “heavy tanks”. Performance decreased, and triggered reliability and maintenance issues, as their engine and transmission were not designed to cope with the additional stress. The T25 displayed VVSS suspensions while the T26 used the final torsion bar system retained on the M26. The T26E1 was the prototype upon which the upgraded production version T26E3 was based on. After a small pre-series, this was standardized as the M26. Compared to the Sherman and previous models, the Pershing was revolutionary. The new Wright engine and short transmission gave it a low profile, as opposed to the Sherman. The glacis plate was one of the thickest ever fitted on an American tank to that point. The torsion bar system conferred a noticeably better ride and was leagues ahead of the tractor-based VVSS, as well as simpler than the HVSS. The large tracks fitted with soft steel shoes contributed to lowering the ground pressure and giving better grip on soft terrain. Above them, two wide mudguards mounted large storage bins for tooling, spares and equipment. The drivetrain, modeled and tested on the T26, counted six pairs of rubberized roadwheels, each fitted on its own wheelarm. They were connected to the torsion bars by the way of an eclectic spindle, and each was also connected to a bumpstop, which limited the motion of the arm. Three out of the six received extra shock absorbers. There was also one idler (identical to the roadwheels) at the front and one sprocket at the rear, on each side. The idlers could be precisely adjusted to the track thanks to a large notch. This meant that the idler could be displaced forward or backward and thus change the track tension. There were also five return rollers. The tracks were a new model, but rather classic in appearance, each link being articulated with wedge bolts and having a two-piece center guide. These were also rubberized. Construction called for large cast sections, front and rear, attached to the hull sides and welded together. Another cast section went across the engine deck for better strength. There was an infantry telephone fitted on the back panel of the engine compartment, inside an armored box. Infantrymen could then communicate with the tank, for close support, even in the midst of battle. The engine compartment was covered by eight armored grids, four openings total, only accessible when the turret was turned to the side. The two rearward ones granted access to the engine, while the two forward ones allowed access to the left and right fuel tanks, the right being shorter to make room for the auxiliary engine and electric generator. There was also a semi-automatic fire extinguishing system. Also on the engine deck was located the radiator filler cap and gun travel lock. The transmission had three speeds forward and one reverse. The differential operated three drumbrakes on each side. The M26 commander’s cupola had a one piece hatch and six direct vision prisms made of thick bulletproof glass, inserted inside the cupola bulge. In practice, the hatch had the tendency to jump loose and a field experiment later passed into general practice consisted of drilling holes into it. The top of the hatch mounted a periscope and the entire structure moved freely around a fixed azimuth scale. When inside, the commander had a lever for traversing the turret left or right. Just behind him was mounted the SCR 5-28 radio set. Due to its lengthwise position, a mirror allowed the commander to use the commands at hand. The gunner had an M10 periscope, with x6 magnification, and to its left was an M71 auxiliary telescope with x4 magnification. The M3 90 mm (3.54 in) gun was power traversed, with a joystick controlling elevation and a pump for manual traverse. The gun also had an elevation handle and, just behind it, a manual trigger, in case of failure of the electrical fire system. There was also a gear change lever, for choosing between the manual or hydraulic options for traverse. At a lower position was found the manual traverse lock, which was used when the turret was reversed and gun lowered and attached for transportation. The gun had a classic percussion fire system and manual breech. The loader also fired the cal.30 (7.62 mm) coaxial machine gun, and had his own vision system. Just left of him were the ready racks, storing ten rounds of various types for immediate use. Additional stowage inside six floor compartments was used. He also had a pistol port. The driver and assistant driver both had sprung suspended seats and single-piece hatches. The driver had a rotatable periscope, immediate access to the semi-automatic fire extinguisher to his left and a brake release. The instrument panel counted (in order) five circuit breakers, a fuel gauge, a lever for fuel tank selector, electrical starter, electrical gauge, tachometer, personal heater, differential settings, fuel cut-off emergency button, panel light trigger, main lights, speedometer, oil pressure & engine temperature gauges, as well as several lamp indicators. The two brake levers had no neutral positions. The turning radius was about 20 feet (6 m). The assistant driver was in charge of the bow machine-gun, a ball-mount cal.30 (7.62 mm), and had a complete set of driving levers if needed to replace the driver, and had a simple hatch periscope which allowed him to see his machine-gun tracers. The turret roof also housed, near to the commander cupola, a multi-purpose cal.50 (12.7 mm) heavy machine gun. Ammunition racks for it and the coaxial cal.30 were found inside the turret rear cast “basket”. It is a known fact that the actual production of the T26E3 preseries, which was standardized in March as the M26, only began in November 1944 at the Fischer Tank Arsenal. Only ten were built this first month. Then it raised to 32 in December and gained momentum in January 1945, with 70 vehicles and 132 in February. Added to this, the Detroit Tank Arsenal also joined this effort, releasing some additional tanks in March 1945. From then, around 200 left both factories each month. In total about 2212 vehicles were built, some after WW2. Although months were needed to train crews and maintenance teams, the first real operations began in western Germany in February-March 1945. -The development of tank destroyers alongside regular M4s and based on the same chassis (McNair himself developed and strongly supported this doctrine) or the introduction of improved M4s (the 1944 “76” versions). -The need to have a streamlined and simplified line of supply. 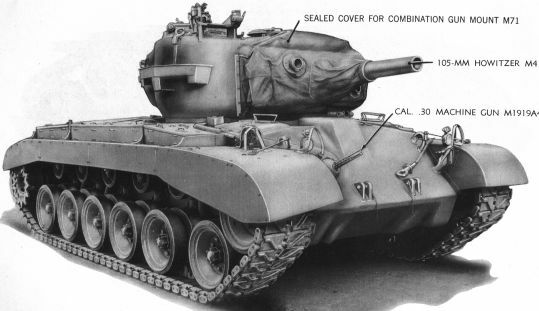 Most US tanks at that time were M4s or based on the M4 chassis, sharing the same components. Adding to this a brand new set of parts and a heavier, untested tank, would have imposed many changes and perhaps jeopardized such 3000 miles long (4800 km) supply lines, which became essential from D-Day on. -A state of complacency after the introduction of the M4, as it was seen as superior to German tanks in 1942 and still a match in 1943. Many officers, including Patton himself, were quite happy with the high mobility and reliability of this model, and opposed the introduction of a new heavy type, which was seen as unnecessary. Even when the Tiger and Panther were encountered in limited numbers, the order to study a new model was not given, and instead time was “wasted” on studying a new electric transmission. Only after Normandy were some efforts made to develop a new tank from the T25. -From Zaloga’s point of view, there was a clear opposition to the development of the T26, only lifted when General Marshall, supported by Eisenhower, overruled McNair in December 1943 and renewed the project, although it proceeded quite slowly. Hunnicut underlines the ordnance requested 500 vehicles of each model in development then, the T23, T25E1 and T26E1, because of contradictory wishes. 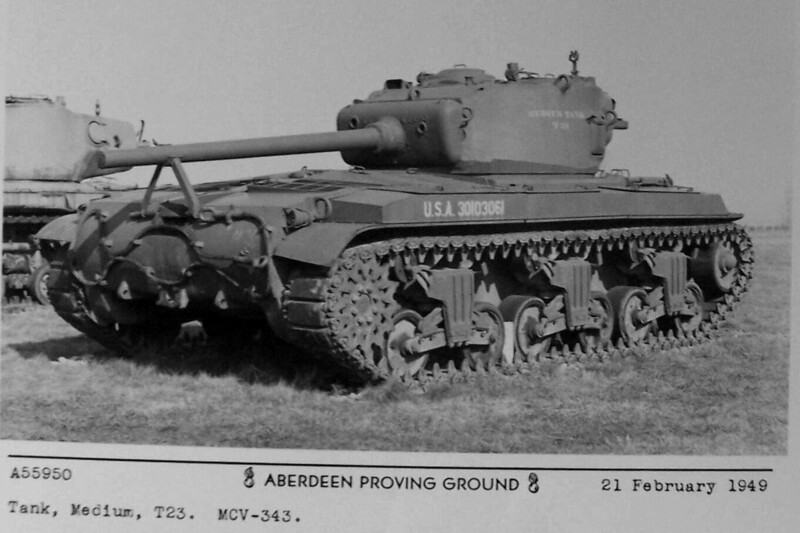 The Army Ground Forces systematically objected to the 90 mm (3.54 in) armed new heavy tank, while the Armored Forces branch wanted the 90 mm (3.54 in) to be mounted on the Sherman. The first combat experience showed that the M26 still fell short on firepower and protection when facing the formidable German Tiger II. Because of this, experiments were carried out with the longer and more powerful T15 gun. 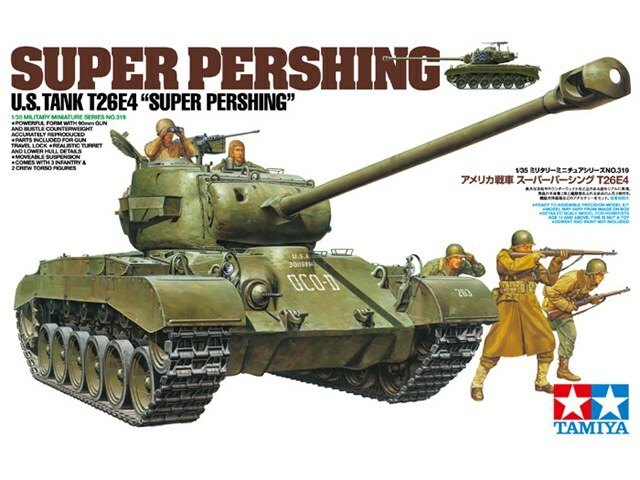 The first vehicle, based on the first T26E1-1 vehicle, was shipped to Europe, where it was uparmored and saw limited combat, being now commonly known as the “Super Pershing”. Another T26E4 prototype and 25 “serial” vehicles followed, with slight differences. This modified version came into production after the war and most Pershings in service were upgraded to this standard. It replaced the M3 with the new M3A1 gun, characterized by a more efficient bore evacuator and single-baffle muzzle brake. 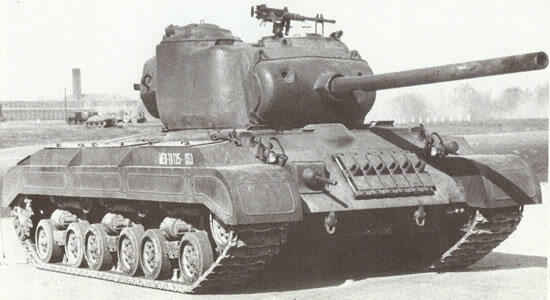 The M26A1s were produced and modified at Grand Blanc Tank Arsenal (1190 M26A1s in all). They cost 81.324$ apiece. M26A1s saw action in Korea. The Army Ground Forces wanted to delay full production until the new T26E3 was battle-proven. So the Zebra Mission was mounted by the Armored Forces Research and Development unit, led by General Gladeon Barnes in January 1945. Twenty vehicles of the first batch were sent in Western Europe, landing at the Belgian port of Antwerp. They would be the only Pershings to see combat in World War Two, spread between the 3rd and 9th Armored Divisions, part of the First Army, although some 310 would be shipped to Europe until V-day. They drew their first blood in late February 1945 in the Roer river sector. A famous duel took place in March at Köln (Cologne). Four T26E3s were also seen in action during the “mad dash” to the bridge at Remagen, providing support, but not crossing the fragile bridge for days. Instead, these heavyweights crossed the Rhine on barges. After the war, M26s were grouped into the 1st Infantry Division, stationed in Europe as a reserve, following the events of the summer of 1947. 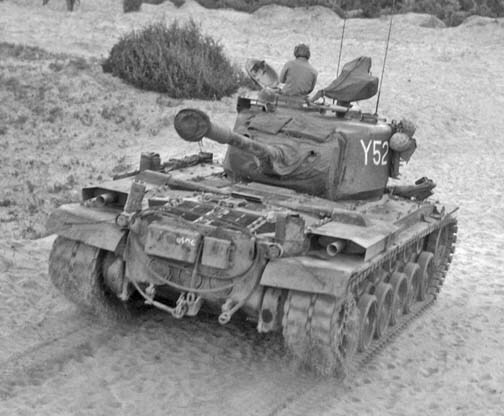 The “Big Red One” counted 123 M26s in three regimental and one divisional tank battalions. In the summer of 1951, with the NATO reinforcement program, three more infantry divisions were stationed in West Germany, and accepted mostly battle-proven M26s retired from Korea. 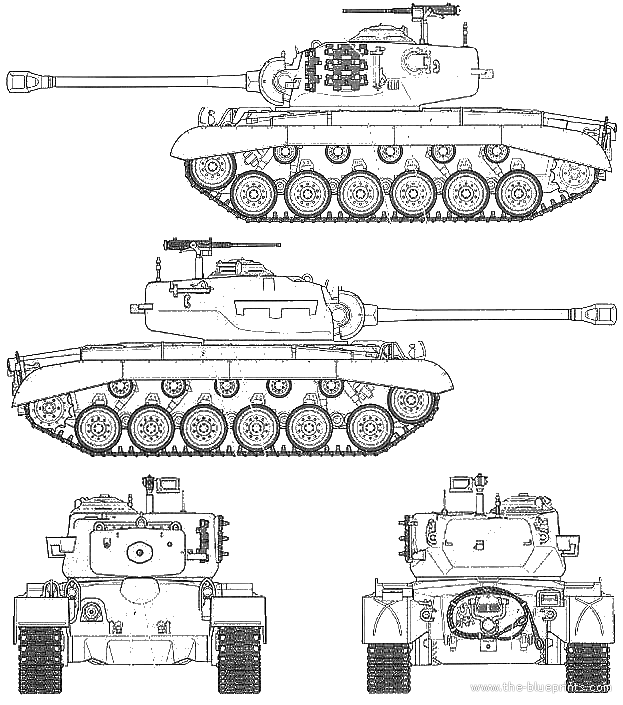 However, by 1952-53, these were phased out gradually in favor of the M47 Patton. The Belgian army inherited the bulk of these, including many reconditioned M26A1s from USA, for a total of 423 Pershings, leased for free as part of the Mutual Defence Assistance Program. These served in three Régiments de Guides, three Régiments de Lanciers and three Batallions de Chars Lourds. 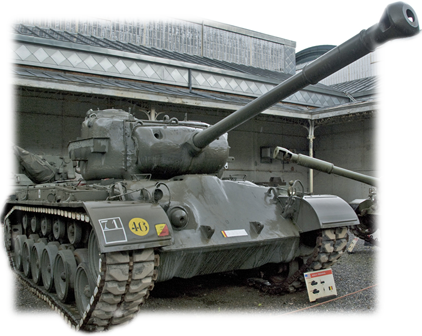 These were also phased out and replaced by the M47 Patton, only two units retaining them by 1961. They were retired from service in 1969. By 1952-53, France and Italy also benefited from the same program and were given M26s. France swapped them soon after for M47s, while Italy retained them operationally until 1963. While the heavy fighting at Okinawa raised concerns about the losses taken by M4s, it was eventually decided to send a shipment of 12 M26s, departing on May, 31. They landed at Naha beach on the 4th of August. However, they arrived too late as the island was nearly secured. The bulk of the M26 (and M26A1) force saw action during the Korean war, from 1950 to 1953. The first units to be called were the four infantry division stationed in Japan, only counting a few M24 Chaffees and howitzer support models. The M24s were quickly found no match for the numerous T-34/85s fielded then by the North Koreans. However, three M26s were found in storage at the Tokyo US Army ordnance depot, and were quickly brought back in service with fortune-made fanbelts. They were formed into a provisional tank platoon by Lieutnant Samuel Fowler. They were deployed in mid-July, first seeing action when defending Chinju. However, their engines overheated and died out in the process. By the end of July 1950, more divisions were sent, but still counting mostly medium tanks, M4s of the latest types. Many M26s were hastily reconditioned and shipped. By the end of the year, some 305 Pershings managed to arrive in Korea. After November 1950, however, most of the tank to tank battles were already spent, and North Korean T-34s became rarer. 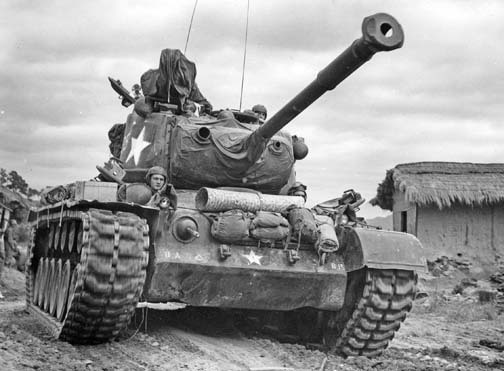 A 1954 survey showed that the M4A3s scored the highest kills (50% because of their large availability), followed by the Pershing (32%) and the M46 (only 10%). However, the kill/loss ratio was clearly favorable to the second and especially for the third, as the M26 found no difficulty getting through the T-34s armor at any ranges, well helped by the largely available HVAP ammunition, while its armor stood well against the T-34’s 85 mm (3.35 in) gun. In February 1951, Chinese forces deployed considerable numbers of T-34/85s, but these were widely spread between infantry divisions for close support. The same year the M46 Patton, the upgraded version of the M26, gradually replaced the Pershing, as it was found unable to display sufficient mobility on the mountainous terrain of Korea. Too late for World War Two, but also not mobile enough for Korea, produced in small quantities related to other models from the same time frame, the Pershing seemed to have been a stopgap model, bound for history’s dark corners. However, it technically started a brand new generation of US Cold War tanks, sharing the same revolutionary suspension system, roomy turret and low-profile hull, better known collectively as the “Pattons”. A dynasty which lasted well into the 90s, when the last modernized M60s in service came to retirement. Many are still found in frontline units all around the world. T25 prototype number 2, mid-1944. This was basically an upgraded T23E3 with HVSS suspensions, new 90 mm (3.54 in) gun and cast turret. T26 prototype, mid-1944. The biggest changes were the new armor and new wheeltrain. T26E3, named “Fireball”, with the 3rd Armored Division. It fought in the Ruhr river sector, was engaged and hit three times by a concealed Tiger on 25 February 1945, at Elsdorf. The Tiger was then discovered, tried to back away to escape, but ran into debris and was immobilized. It was eventually abandoned by its crew. The M26 was later salvaged, repaired, and returned to combat. Another one of the same company later engaged and destroyed a Tiger and two Panzer IVs. Camouflaged T26E3 in Germany, May 1945. The pattern is purely fictional, as there is no clear evidence of them being camouflaged. M26 of A Company, 1st USMC Battalion, Korea 1950. M26 Pershing in winter camouflage, Korea, winter 1950. M26 of A Company, 1st USMC Tank Battalion, Korea, 1950-51. M26 of A Company, Naktong Bulge, 16 August 1952. M26 of C Company, 1st Marine Tank Battalion, Pohang, January 1951. M26A1 with its side skirts mounted, 1st USMC Tank Battalion, Chosin reservoir, 1950. M26A1 “Irene” with uplifted side skirts, D Company, 1st USMC tank battalion, 1951. M26A1 from the 1st USMC, Korea, 1950. M26A1 near Hamburg, West Germany, 1950. A M46 Patton in 1951 with the famous “tiger pattern”. This was an upgraded version of the Pershing, sometimes called M46 Pershing. The M46 was followed in development by the M47, the main battle tank of the US Forces and NATO for years. Now that’s some American heavy metal!!! Why are you even mentioning Belton Cooper or his book? Most of that book is filled with incorrect information and he cites no sources. General Patton had absolutely no influence on tank development during the war. In the 7th paragraph, you refer to the Pershing as having the “the new Wright engine.” This is obviously incorrect, and is contradicted by information contained elsewhere in this same article. N.B. The information presented in the video is based on actual research of historical military archives that was carried out firsthand by the speaker himself. The link above starts the video at the section specifically relevant to the Pershing (from 13m 31s), but the whole video is actually very informative and well worth watching. Did the tank have a stabilizer on the main gun? Correct me if im wrong but as I remmber R. P. Hunnicutt in his book Hunnicutt, R.P. (1971). Pershing: A History of the Medium Tank T20 Series. Navato on page 201 suggest that the speed is 25 mph Medium tank M26 Pershing. Sources seem to vary on this point, generally the stated speed is between 25-30mph (or the equivalent in metric) depending on the author. I would suspect that 30mph was the maximum tested speed (ie the fastest they got it to run under ideal circumstances during trials) while 25 was the maximum conventional speed. Well absolutely agree with you thats why I was suprised that here is 22 mph. All the books I have seen so far are 25-30 mph. And sadly I cant test it. Under the m26 design, at the start of the 6th paragraph it says the m36 commander’s cupola. Small error I’m guessing but thought i would mention it.